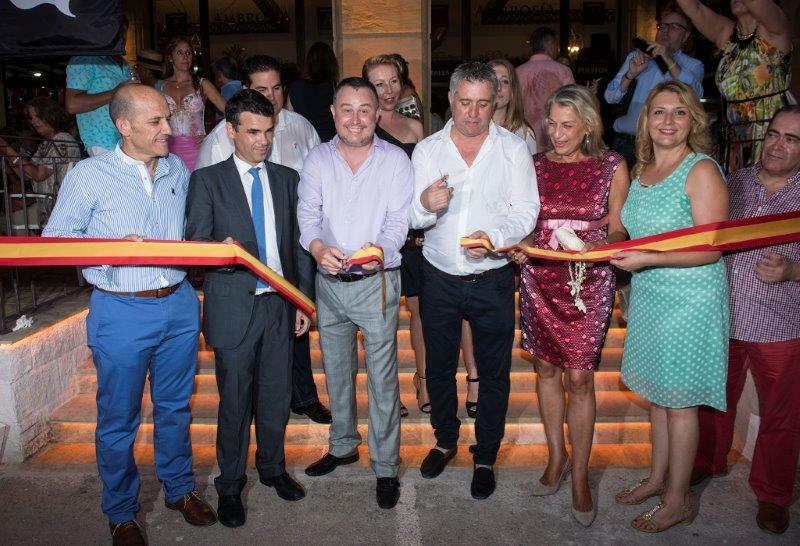 AMBROSÍA, the first gourmet market on the Costa del Sol, is now officially opened. The market opened its doors to the general public and will be offering free beer and live music throughout the weekend to continue the celebrations. The event celebrated months of hard work that have now come to an end, not just with the building works that have refurbished the venue, but also the planning behind this new concept, as the owners themselves recognize how difficult it was to choose the final selection of the 14 gourmet-stalls at the market. The celebrations will continue this weekend as the market is inviting customers to visit the new market on Friday and Saturday and try the artisan Estrella Galicia beer for free. The mayor of Marbella, José Bernal, wanted to give his support to the project by attending both the media presentation and the opening party, where he was in charge of cutting the official ribbon. At both events the mayor highlighted the importance of having a catering project of this size in Marbella, not just for its economic investment (that amounts to 1 million euros) but also for its impact on the labour market as it has already generated almost 100 jobs. He talked about how the project will boost Marbella's image as an area of top-quality service, how it will break the trend by opening 365 days a year, and above all, how it will place Marbella on the national map in terms of gourmet-markets. The private event was attended by over 400 guests who were lavished with beer from Estrella Galicia Bodega, as well as other drinks and tasters of delicatessen from the new multi-business. The guest list mainly consisted of people who are involved in the project, along with several important personalities from the province of Málaga. A number of institutional representatives were present at the event, including the vice-president of the Málaga county council, Francisca Caracuel and three councilors from the Marbella city council, Javier Porcuna, Ana Isabel González and Manuel García. The Honorary Consul from Hungary in Málaga, Patricio Baeza, also supported the opening of this initiative, since one of the AMBROSÍA partner's is Hungarian. It should also be mentioned that the Argentinian footballer Martín Demichelis (current Manchester City defender) attended this event, accompanied by his wife Evangelina Anderson and their sons. The party took place inside both the spacious market (approximately 1000 m2) and the terrace areas, and some of the market’s car park was used for the event. A jazz band brought life to the soiree, which went on until after midnight and ended with a special performance by the renowned artist Lexter. Hosting the event were AMBROSÍA co-founders Antonio Ortiz and Gabor Somlai, who also presented their multipurpose project to the media and food bloggers at a press release last week, announcing that there wasn't long till to wait until the market was launched. From today onwards, the market will be open 365 days a year, from 10:00a.m. until midnight, apart from weekends when it will open at 2:00p.m. Where is it the address Ambrosia?